A short report of the first day of the council. Kind host of UNIMA Council Meeting Annette Dabs, artistic director of Fidena Festival, greeted participants of the Council Meeting and emphasized the importance of international organizations like UNIMA. Dadi Pudumjee, president of UNIMA, after thanking secretary general Idoya Otegui and treasurer Lucile Bodson for their tremendous efforts, said: “We must work towards a more inclusive and progressive union of puppeteers, artists and human beings we must think of the status of the organization UNIMA affiliated to UNESCO, I remind you that we will celebrate our 90th anniversary in 2019. Making us one of the oldest international theatre organizations of its kind in the world.” Treasurer Lucile Bodson presented the financial situation of UNIMA and concluded her report with the thought: “This situation has an impact on our daily functioning and the activity is based on reduced human resources: all members must feel concerned by this situation. The search for financial means is an imperative that concerns us to move forward.” Secretary general Idoya Otegui prepared a detailed report about her extensive effort to make UNIMA a better organized and visible organization. Among many activities she worked on is strengthening the ties with French institutions which traditionally support UNIMA, she strengthened the relationship with UNESCO, she organized activities and presentations at Festival Mondial des Theatres de Marionettes in Charleville-Mézières in 2017, she prepared many activities for World Puppetry Day and so much more. Especially moving was the “Thank you” to loyal UNIMA employee Fabrice Guillot who retired last year with gifts from Dadi Pudumjee and Idoya Otegui. The first day ended with informal meetings of the commissions. 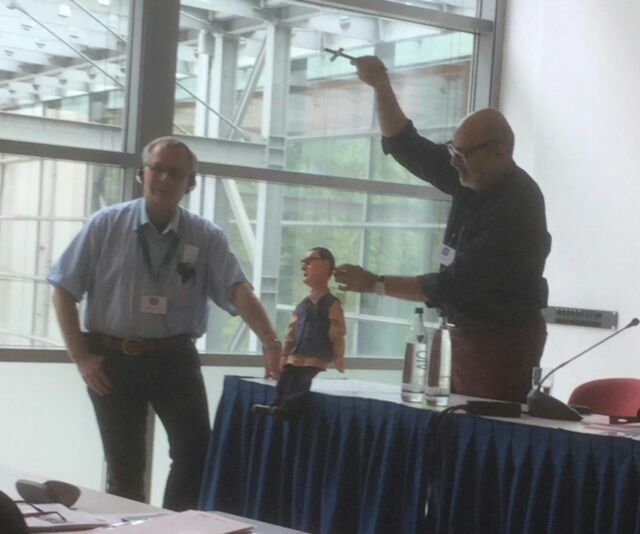 I know I speak for members of UNIMA throughout the world when I say “thank you” to all members of the UNIMA Council for your tireless and dedicated advocacy on behalf of the puppetry arts around the world. How fortunate we are to be represented by intelligent leadership, wisdom and generosity of heart and mind, as your efforts continue to strengthen our puppetry community globally and in each of our respective countries. Have a great meeting.